Wine and beer crossovers defy convention. How are they being marketed to younger drinkers? 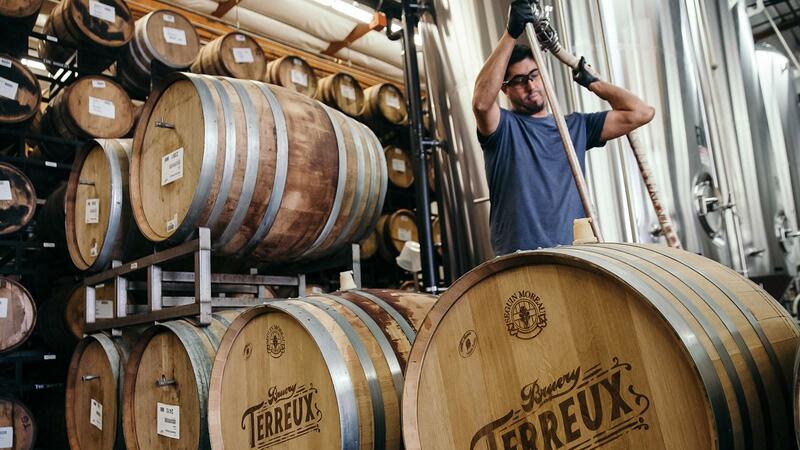 The team at Bruery Terreux is intent on having the wine grape's character expressed in their hybrids. We Millennials are difficult to pin down. Do we even care if such-and-such wine is a Cabernet or a Pinot? Marketing types are regularly seeking to woo the youths into consuming their products, and I've also been contemplating this matter. One thing is sure: There's a sense of individuality and you-do-you-ism to this generation that has carried over to alcoholic beverages. The recent move toward drink crossovers, or hybrids, is only natural, as people just love to create something new and exciting from two things that already exist—the Cronut, frosé … brunch. Now enter: winebeer and beerwine. "I think the wine industry lacks a lot of relevancy to today's customer; it's got this unnecessary pomp about it," says Ben Parsons of Infinite Monkey Theorem, a Colorado-based urban winery. Parsons makes a dry-hopped Sauvignon Blanc (in a can, of course) with Citra hops. Being in Denver, around such a strong beer culture, it made sense to him to experiment with hopping wine. "It kind of piques the curiosity of beer nerds and people who might not necessarily be interested in drinking wine," he says. Allan Scott winery in New Zealand has also been making a hopped Sauvignon Blanc for years, with Nelson Sauvin hops, a native variety that's named after Sauvignon Blanc because of its gooseberry aromas. These drinks could well be a way to bring in new audiences. Crafting a product like wine with unexpected elements can change preconceived notions about what the base beverage is or has to be. On the flip side, an increasing amount of beer is being made with wine components. Take Vista Brewing, a new Texas brewery located between Austin and the Hill Country wine region. Owners Kent and Karen Killough and brewmaster Josh Watterson are repurposing local wineries' barrels to age their beer. But while barrel-aged everything is on-trend nowadays, the team at Vista is using freshly dumped barrels, getting them the same day or the day after they've been rid of wine. "Our flavor profiles aren't just a red wine or a white wine fermentation; we're talking about a Viognier or Aglianico fermentation," says Watterson, who formerly made wine in Oregon. He wants those grape flavors in his end-product, as opposed to working with a neutral barrel. As a result, Watterson says the beers have more tannic structure and more acidity. "It sits much more on the table like a wine than it does a beer," he adds. Vista's wine barrel–aged beers are offered in 750ml bottles, and most of the line is labeled with a specific grape. Jeremy Grinkey was also once a winemaker. Now, he's the production manager of The Bruery's Terreux brand in Placentia, Calif., and makes wine-beer hybrids. "I wanted to design a beer that doesn't just get Chardonnay put into it, but actually can help influence the Chardonnay character, and in the end product, we want that grape to come across," says Grinkey. He works with vineyards and wineries across the state, from Paso Robles to Santa Barbara to Malibu, and thinks carefully about how each variety he chooses translates into beer. Wine grapes are pressed before being co-fermented with the beer's wort at Bruery Terreux. Bruery Terreux makes these hybrids by co-fermenting the grapes with the wort (the sugar-rich liquid extracted from the grain during the mashing process). The range has included an imperial stout with Napa Cabernet, a sour ale with whole-cluster Grenache from Santa Barbara Highlands Vineyard, and a lighter blonde sour with Riesling from Fess Parker. "It was polarizing," Grinkey laughs as he remembers the release of the first such products. "But people who like wine thought it was very interesting." These are also sold in a 750ml bottle—with a cork, an extra step toward winehood. The wine-like beers are taking a different approach from that of the hopped wines, which are largely aiming to demystify the base beverage. But the two sides of this coin are a reflection of a similar trend. "There's an overall democratization of wine now," says Kent Killough of Vista Brewing. "Combined with an elevation of beer, this is going to create an increasing overlap between those two consumer bases." Kent expects that a younger demographic that has disposable income but is less married to tradition will be likely to jump at these new, unconventional products. "I think the younger generation really wants an experience more than they want to drink; they want the next newest thing," says Grinkey. After having had my fair share of winebeer and beerwine, I look forward to tasting the latest hip portmanteau of alcoholic beverages. Any recommendations? Alesong here in Eugene has been doing something similar with Muscat and Pinot Noir grapes in their beers and aging them in wine barrels. The last pinot noir "beer" really did taste like pinot noir, but it was definitely beer. Very interesting but very tasty!